Many people choose to dress up for a day at the races and, although often not mandatory, it is considered to be part of the raceday experience. The Racing Post has compiled a list of everything you need to know when deciding what to wear at the races. Although far from compulsory in all enclosures, smart dress is the accepted dress code for racegoers. Trainers and shorts are widely regarded as unacceptable, although not forbidden in some enclosures or at some meetings. The classic Flat racing attire for men is a collared shirt with trousers and smart shoes. Some choose to finish the look with a tie and blazer but this is personal preference, and to some extent determined by the weather. Jumps meetings tend to adopt a dress for the weather approach as opposed to a strict dress code, as most of the big meetings take place during the winter months. An old traditional among jumps fans is to wear tweed, but that is simply a personal preference. Even when deciding what to wear to the Cheltenham Festival, it is best to dress for the weather, unless you are lucky enough to be a corporate guest, in which case a suit may be more appropriate. Many ladies attending Flat race meetings in the summer, associate a day at the races as a day to dress up in all their glitz and glamour, although this is not compulsory in many areas. Some of the more prestigious meetings and the ever growing number of ladies’ specific days put the spotlight on fashion, while some meetings offer competitions for the best-dressed racegoers to enter. As with the gentlemen, it is a case of wearing weather-appropriate clothing in the winter, with heels not advisable in the likely wet conditions. Royal Ascot is a prestigious five-day meeting in June that is steeped in history, and one of its most traditional elements is the dress code. Strict standards of what to wear are set by the racecourse and failure to comply can result in entry being denied. For example, the Royal Enclosure demands all gentlemen wear a three-piece morning suit and top hat at all times. Ladies must wear a hat or headpiece at all times, as well as conform to an extensive list of restrictions regarding their outfits. Ascot also recently introduced a rule that all gentlemen should be wearing socks. For full details of all dress codes, please refer to the individual racecourse websites, most of which provide great advice on what to wear for your day at the races. Racing can be hard to understand for a beginner, with races run on different ground, over a variety of distances, with obstacles and without, beginning with different types of starts, and with horses often carrying different weights. It can all get a little confusing, but our guide below breaks down everything you need to know about ‘the race’. What are the main differences between a Flat race and a jumps race? The first thing you will notice after taking a position in the stands is the starting point and indeed how the horses will start. In Flat racing, horses go into numbered starting stalls which have been pre-assigned in a draw. Some horses can become agitated going into the stalls but they are looked after at the start by expertly trained stalls handlers and the stalls are designed to start the race in an orderly and fair manner. Jump races start differently, with horses and riders being asked to walk in slowly before a flag is dropped to start the race. Race distances are another major difference between Flat and jumps racing. Flat races are run over a minimum of five furlongs (1,000 metres), up to a maximum of nearly two miles and six furlongs. In jumps racing, the minimum distance is around two miles (although sometimes shorter in National Hunt flat races), with the Grand National at Aintree run over approximately four miles and two furlongs. The other noticeable difference is in the name, as horses have to jump obstacles, be it hurdles or fences, in jumps racing, whereas Flat horses race on the level. In both Flat and jumps racing, there is a set starting point and a set winning line. A photo-finish will be used to determine the winner if the finish is particularly close or, occasionally, to declare a dead-heat between two or more horses. Both types of racing, Flat and jumps, have races where all horses compete carrying the same weight, but both also have races where competitors carry different weights based on their handicap ratings or on penalties for previous wins. As a rule of thumb, jumps horses carry more weight than Flat horses. Races can be run on a variety of ground conditions, ranging from Heavy to Firm, and optimum surfaces differ for jumps and Flat. For example, Good to Soft ground might be ideal for the start of the Cheltenham Festival, whereas Royal Ascot would be ideally run on Good to Firm ground. All-weather racing takes place on a synthetic surface, although there are numerous types of synthetic surfaces. During a race, each jockey attempts to optimise their horse’s ability to give them the best possible chance. Plenty of horses have a preferred running style, with some liking to be held up before challenging late, while some try to win from the front. Some tracks suit certain types of horses better, but in essence, any horse with any style of racing can win a given race, depending on the tactics and pace of the race. In the later stages of a race, usually the final couple of furlongs, jockeys will manoeuvre their horses into the right position so they can challenge for the win if their horse is going well enough to compete. At this stage some jockeys will appear to be a bit more active, bouncing and beginning to urge their horse more forcefully, at which point the commentator may refer to that horse as ‘off the bridle’. The outcome of many races hangs in the balance well into the final furlong, leading to an exciting spectacle, although wide-margin victories are more common in jumps racing due to the more extreme race distances and ground conditions. Plenty of racegoers have their own preparations for a day at the races and perhaps even a routine during the meeting, but what about the horses? We see them race out on the track, but what happens before and after their race? Well, the paddock and the stables play a big part. Often referred to as the parade ring, the horse paddock is where the runners in the forthcoming race are paraded for racegoers to get a proper look at them. The parade also gets the horses moving and relaxed. The horses do not start in the parade ring, though, as after being transported to the track and checked over, most horses go through the pre-parade ring first. This is situated closer to the stables and the horses are not kitted out yet with racing equipment such as their saddle. The horses are led around by their grooms, with the process designed to help them stay warm and focused. Racegoers can get an early look at the horses without saddling equipment to assess their raceday demeanour and fitness. Nearer race time, horses will move from the pre-parade ring to the main paddock. A major selling point for racing is how close racegoers can get to the heart of the action in situations like this, where it is possible to get a really good look at the horses before the race. Owners and trainers (often collectively referred to as ‘connections’) will be waiting for the jockeys to appear and to talk over their tactics for the race, before the jockeys get aboard their horses and depart the parade ring to go out on the track. Many racegoers will use the period when the horses are in the paddock to assess each horse’s movement and demeanour. While this is far from an exact science, things to look out for include whether the horse is moving well and is in good condition with a shiny coat. If a horse becomes sweaty or noticeably anxious, its chance of success in the race may be affected. Watching inexperienced horses like two-year-olds is always fascinating, as pre-race behaviour can provide a clue as to what their temperament is likely to be out on the track. Following the race, the winner and placed horses return to the winner’s enclosure, which is often but not always situated in a part of the parade ring. The horses will be unsaddled so the jockeys can weigh in and connections will often pose for photos, pick up their prizes and do some interviews. The horses are often kept moving around slowly by their grooms in order to help them recover from their exertions and washing down is a regular occurrence at this stage. Once every jockey is weighed in and the announcement of ‘horses away’ is given, the horses return to the stables, where the horses who finished unplaced in the race will have already gone. There are horse racing stables at every racecourse. This is where the horses are kept before and after races and where they are assessed by vets for pre- and post-race injuries. The stables area cannot be accessed by racegoers and is usually situated out of public view. On-course betting remains an integral part of a day at the races. 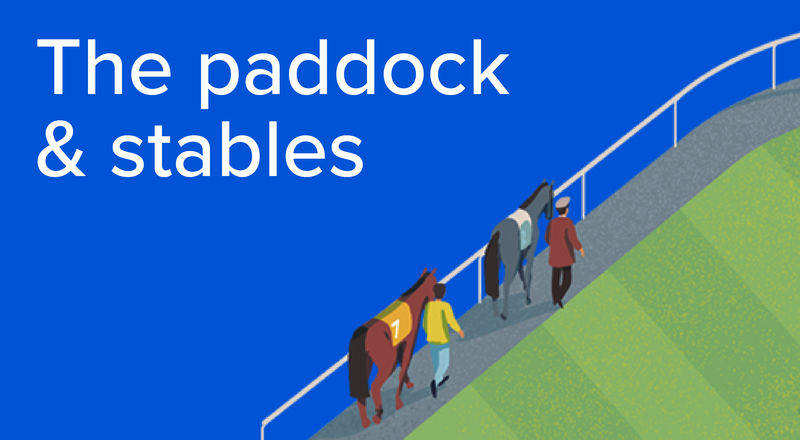 Racecourse bookmakers compete with one another for our custom and ensure that punters can get a good-sized bet on, at a competitive price before a race. Racecourse bookmakers are nothing to be afraid of. Walk into the betting ring, select a racecourse bookmaker and tell them the number on the racecard of the horse you wish to back. 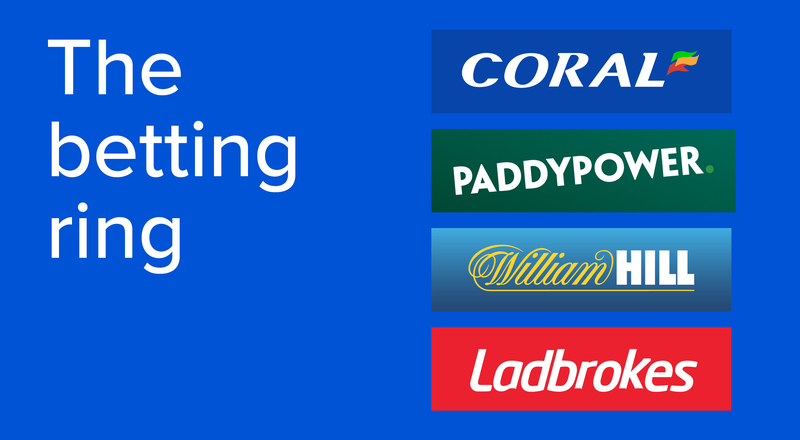 Prices and place terms can vary with different racecourse bookmakers, so it is always prudent to shop around the betting ring to find the best possible deal. For instance, if you wanted to back a horse to win, simply say ‘£4 win number 7, please’, provided the minimum stake is not £5. You will be given a ticket by the racecourse bookmaker with the details of your bet, including the odds and how much you will receive if the horse wins. To back a horse each-way, say ‘£4 each-way number 7, please.’ It is, of course, two bets – £4 to win and £4 for a place, making a total stake of £8. Each-way terms vary by bookmaker and you should always check you are getting the best terms. The place part of your bet will be determined by how many runners are in the race and the terms the bookmaker is offering. A race with seven runners or less will have place terms for the first and second placed horses. A race with eight or more runners will have place terms of first, second and third placed horses. 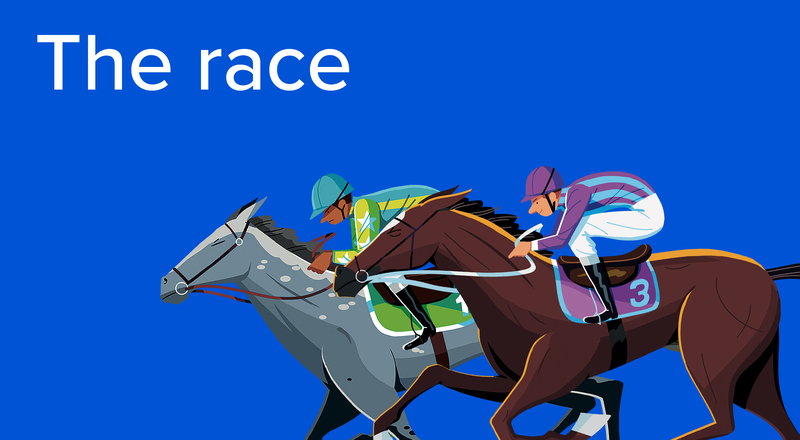 If there are fourteen or more runners in a race and the race is a handicap, then the place terms are increased to first, second, third and fourth-placed horses. Bookmakers will usually offer place terms of 1/4 the odds, which means if your horse places in a race, then you will receive 1/4 the odds on the place part of your bet. Some bookmakers offer enhanced terms for each-way bets so make sure you compare place terms before placing your each-way bets. There are two main differences between betting with a racecourse bookmaker and with the Tote. Firstly, Tote bets are pool bets. All the money bet goes into a pool. The Tote takes a percentage and the balance is divided between the winning tickets. The odds are determined by the size of the pool and the number of winning tickets; the bigger the pool and the fewer the number of winning tickets, the higher the dividend. When you place your bet, a screen will show the dividend for each horse at that moment but it might change by the time the race starts. Secondly, as well as win and each-way bets, the Tote allows you to back a horse just to place. When placing your bets with the Tote, you simply give the racecard number of the horse you wish to back at the Tote window, as you would with a racecourse bookmaker. Exacta – Select the first and second horse to finish, in the correct order. Trifecta – Select the first, second and third horse, in the correct order. Placepot – Select a horse that places in each of the first six races. Scoop6 – Select the winner of each of the six selected Saturday races. There is a consolation dividend if all your selections place, with a bonus for six winners. Not all of these ‘exotic’ bets are available on every race, nor every day. In the case of some bets, the pool is rolled forward if there are no winners and can produce huge payouts for the Jackpot and Scoop6. The Placepot is a very popular bet, providing an inexpensive interest throughout the afternoon (or, at least, until one of your selections is unplaced). 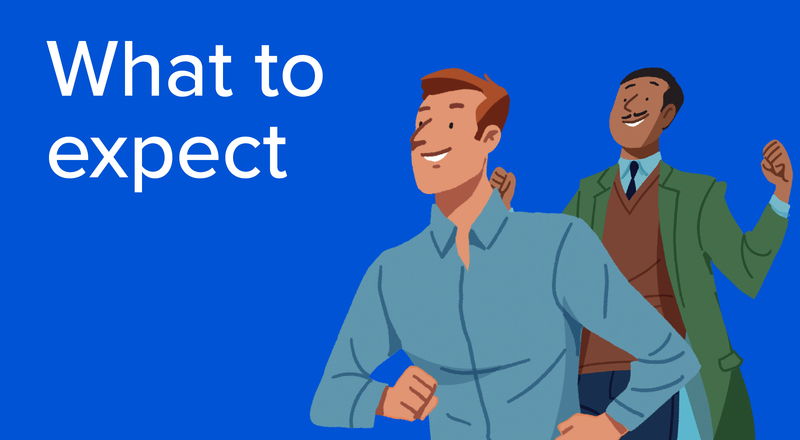 Furthermore, you can have multiple combinations of selections, increasing your chances of winning, but also increases the cost, which can be as small or as large as you choose. Copyright reserved to Bluffer’s Media. 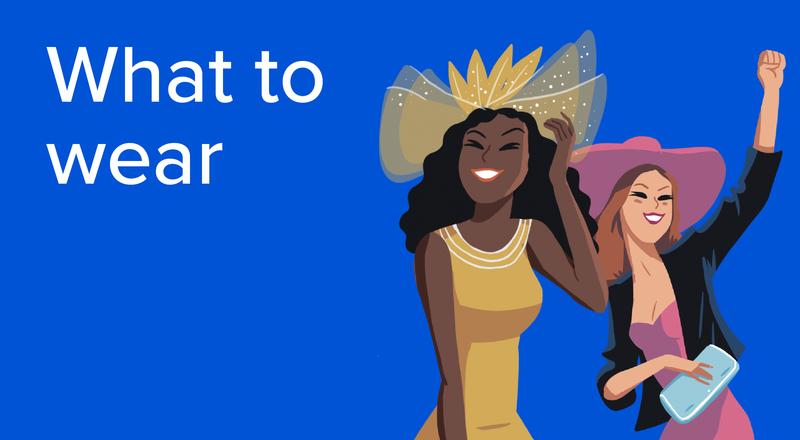 Heading for a day at the races? While the high-class sporting action out on the track is the main draw for many, a typical race day offers a whole host of other things to see and do. Most racecourses open their gates about two hours before racing and sometimes earlier at the bigger meetings where large crowds are expected. Picking up a race day programme when you get to the course is a good idea, as it provides a handy reminder of when the races are, which horses are running in each race and what colours they will wear, in addition to information on attractions and entertainment that may be going on throughout the day. The areas that are accessible to spectators vary from course to course and often depend on the type of ticket you hold. A general rule of thumb is the more expensive the ticket, the more areas you are able to access. Extra bars, restaurants, viewing steps, betting options and different areas around the parade ring may be available at some courses with a more expensive ticket, although most courses offer some version of these facilities regardless of the ticket you hold. Some areas of a racecourse are restricted from all spectators and are available only to those directly involved with racing, such as the trainers, owners, jockeys and medical personnel, to name a few. These areas include the weighing room and the stables. Using the time before the first race to locate food and drink outlets, the parade ring, the betting ring and a good spot to watch the action from the stands is always a good idea. Many racegoers will use the hour before racing to look at the card, be it in a racecard or in a copy of the Racing Post, and pick out their selections. It is always worth exploring the pool betting options with the Tote before the meeting gets underway, with the Placepot a particularly popular pool bet among those at the track and which has to be placed before the first race. With less than half an hour to go until the first race, horses will soon start to enter the parade ring. Grabbing a good spot around the parade ring is always useful and provides a unique opportunity to feel at the heart of the action with a close-up view of the horses and jockeys. How many other sports offer you the chance to get so close to those taking part? This may help you decide which horse you would like to back, based on their appearance or how fit they look. Once you have had a good look at the horses in the parade ring or when they go off to post, it is time to find a good spot in the stands and place a late bet if you wish to. Listen closely to the announcer or commentator, in case there are any late changes to the field. Many racegoers may follow a repeat method throughout the intervals on the card, settling into a routine that may include visits to the parade ring, betting ring and a food or drink outlet (in no particular order). There are no right and wrong answers as to what to do between the races, with the intervals varying in length from 30 to 45 minutes. Lounge areas and formal restaurants and bars are often frequented during these parts of the day. Increasingly racecourses are ensuring the show does indeed go on, even after the final race has concluded. Plenty of meetings offer live entertainment or music after the racing, with bars remaining open until a couple of hours after the final race. It can be a perfect way to complete a day at the races.